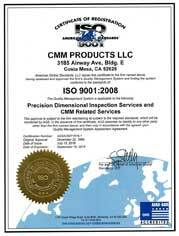 CMM Products LLC is a high-tech company on the leading edge of dimensional metrology. We provide services and products to many industries including automotive, aerospace and medical to name a few. We are looking for employees who embrace technology and want to learn more. We are looking for Field Service Engineer to install and calibrate coordinate measuring machines in house or at our customer’s facility. Knowledge of machine controls, servo drives, linear and rotary feedback systems. Must possess good communication skills, reliable vehicle and have the ability to travel. Recent Technical College graduates may apply.